This easy crockpot chicken and rice recipe makes a great everyday family dinner that is a snap to prepare and cook in the slow cooker. We used cream of chicken soup with herbs in the recipe and it made a delicious sauce. Consider using a cooking bag in the slow cooker to make cleanup easier. If you think you might have to let the meal cook longer or if your slow cooker seems to cook a bit high, make the dish with boneless chicken thighs and cook the rice separately. Chicken thighs don't dry out like chicken breasts, and they are more flavorful. This recipe lends itself to a multitude of variations. Arrange the boneless chicken breasts in the crockery insert of the slow cooker (or in the bag if using a cooking bag placed in the crockery insert of the slow cooker). In a bowl, whisk together the cream of mushroom or cream of chicken soup with 1/2 cup of water until well combined. Pour the mixture over the chicken. Sprinkle the rice over the chicken and then pour the chicken broth over the rice. 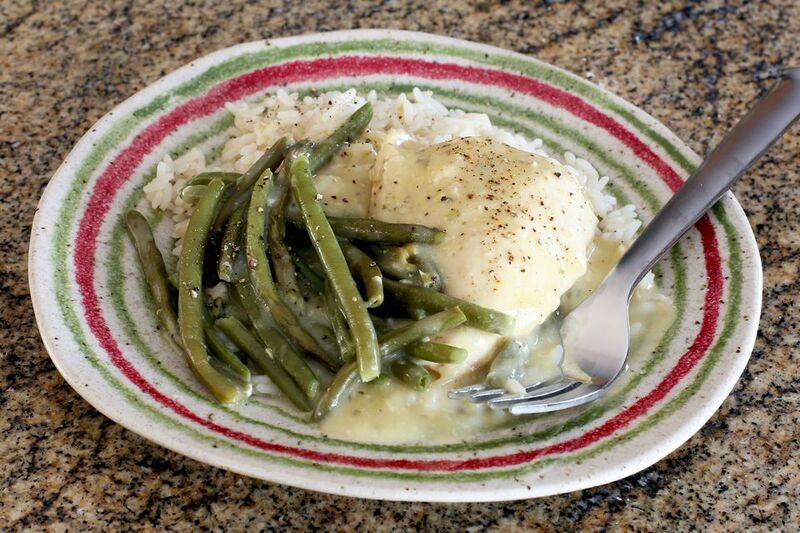 Top with the thawed green beans; sprinkle lightly with freshly ground black pepper. Cover the crockpot and cook on LOW for 5 to 6 hours, or until chicken is cooked and rice is tender. *Converted rice has been partially parboiled while still in the husk. Because of the process, parboiled rice is more nutritious. It takes a little longer to cook than long-grain rice, but it holds its shape better in the slow cooker so you don't end up with a solid clump. We recommend cooking long-grain rice separately because even the converted rice is somewhat mushy after 5 or 6 hours. **To thaw the green beans, put them in a colander and run cool water over them for a few minutes. This recipe can be adjusted to your family's likes and dislikes by substituting the protein and vegetable with others. Use cream of celery or a similar soup in place of the cream of mushroom or cream of chicken. If using dairy products like milk, sour cream, and cream, they break down over long, slow cooking, so don't add them until the last hour of cooking time. Use frozen peas or broccoli instead of green beans, but add them about 1 hour before the dish is done. Layer slices of ham over the chicken for an extra layer of flavor and feel free to add a sprinkling of shredded cheese over the green beans. Mushrooms can be added along with the condensed soup. Use boneless turkey tenderloins in this dish instead of chicken breasts.